← Escape to… The Oak Tree Farm! A year ago here at The Oak Tree Low Carbon Farm we were fighting for our future, and the global village came to our rescue thanks to the success of our Save The Oak Tree. If you were one of these lovely people then, once again, thank you so much. Even in the midst of the crisis we were planning for the future. Now seems a good time to look back at what we have achieved since then. Of course, no plan survives contact with reality, and indeed we have adapted to many challenges, while still very much looking to the future! Down on the farm, there is both good, and less positive, news to report. Our fruit trees and bushes are thriving, and I am just now launching our first “fruit shares” for our members on a pick your own basis! We’ll soon be appearing on an episode of “Escape to the Country” following a fun day of filming a couple of weeks back. Our animal feed costs have plummeted thanks to a local bakery generously giving us its waste bread, no longer fit for human consumption, for our pigs and chickens! We are producing more meat than our members can eat! 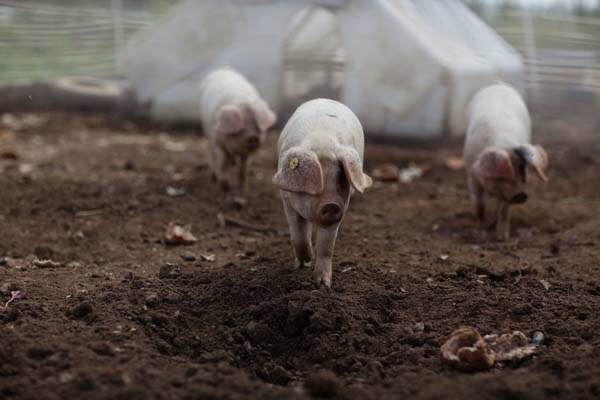 Please do support the farm by buying a pork share when it next becomes available (sign up for our occasional newsletter to be notified of this, and other, happenings on the farm)! It is excellent, and while it is a “less convenient” way to buy pork, it is friendlier, and the pork is unlike anything you’ve ever tried! Our harvests so far this year have been good, despite the wet and dark weather which has caused even Bob Flowerdew to report that his tomatoes are on the drag! And we have a wonderfully positive community of members at the moment who are supportive and hardworking, which gives the farm a lovely atmosphere. We’ve also had a quite remarkable soil improvement results thanks to Richard’s work with Dr Elain Ingham’s Soil Food Web methods. His blog post on this is well worth a read! On a less positive note, we are really struggling to retain staff because of the low wages that we are obliged to offer due to the farm’s fragile finances. As a result of this, we have had to scale back our cut flower operation this year, we’ve only been able to offer flowers for sale to farm members. 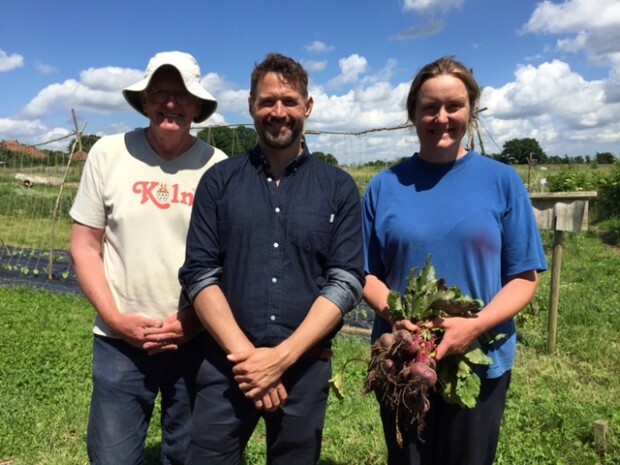 We now have just two growers, myself and the wonderful John (who works three days a week). The resulting reduced wage bill means the “Save The Oak Tree” cash can be eked out for longer, but it does leave the farm at risk if either of us suffers from ill health, and it is a real struggle to develop new enterprises alongside the everyday work of feeding our members and caring for our livestock. Also, while we are making steady progress on our farm building feasibility study, progress is slow. I get the impression that our local planning department is simply overwhelmed by work. While they try to help us, they are very slow to respond to questions which we need answered before we can put in an application for planning permission with any hope of success. This delays the day when we can apply for the grant funding that we so desperately need to develop the farm to its full potential, as significant grants would be dependent on planning permission. In summary, we are working to reduce costs as much as possible (not that we ever wasted money, we’re just being even more careful than usual!) and working as efficiently as we can to bring in extra cash through fruit, meat and egg sales – with a view to reducing our loses as much as possible. We hope we’ll be able to keep going for long enough to get planning permission for our building so we can apply for grant funding to “subsidise” the many social, environmental, educational and health benefits that we’d be then able to offer to even more people. A couple of grant giving organisations have expressed a serious interest in helping us at that stage, both in paying for the building, and helping with paying proper wages, so for now it is time to grit our teeth and keep going! Life post Brexit looks uncertain to us all (in case you are wondering, I voted to remain, but we are where we are) and these uncertainties are keenly felt here at The Oak Tree. Will we see big food price hikes, given our currency has plummeted in value and we import much of our fresh fruit (90%) and veg (40%)? Will there be any significant change in government policy concerning agriculture? Every household in the UK pays, on average, around £250 each year to the EU Common Agricultural Policy which dishes out enormous subsidies to already rich landowners who don’t even have to farm the land to qualify. Here at The Oak Tree Low Carbon Farm we receive no subsidies at all, (we’re “too small” – everything is geared up to megascale, and mega capital investment) yet the current shortfall in our finances is just about £200 per year per household that we feed – less than the amount UK households pay towards EU subsidies! We invite you to help us to hold the line until we get planning permission for our building. 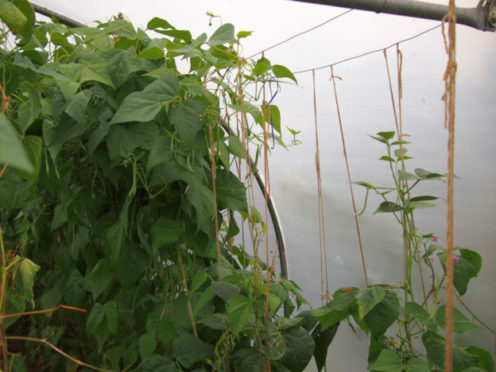 Please do support us with a donation (call it an “ecological & community farm subsidy”). This entry was posted in general news, milestones, policy, savetheoaktree and tagged challenges, finance, Grants, progress, tv. Bookmark the permalink.